WP1. Project coordination, management and dissemination. 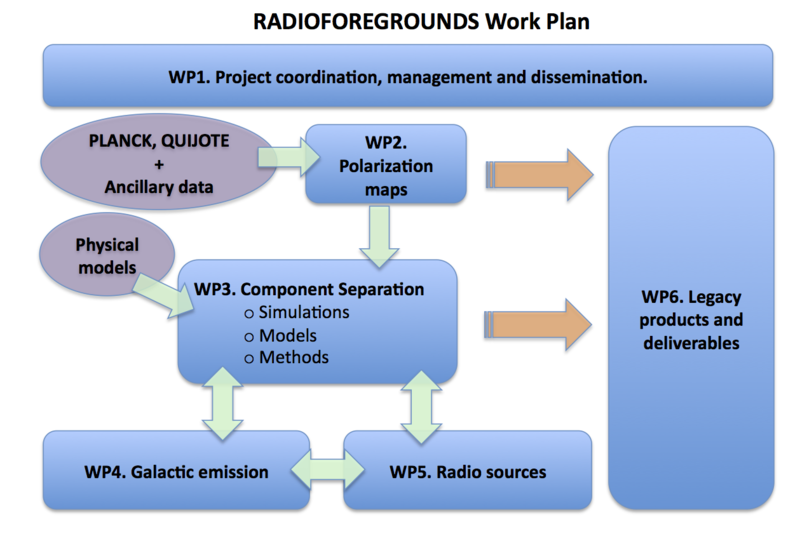 WP1.1 Project Coordination and Management. WP1.2 Dissemination and exploitation of results. WP2. Cross-calibration of the QUIJOTE and Planck frequency maps. WP3.2 Optimized component separation methods. WP4. Modelling the Galactic emission: Intensity and polarization. WP4.1 Modelling the diffuse Galactic synchrotron emission. WP4.3 Modelling the anomalous microwave emission (AME). WP5. Modelling the radio source polarized emission. WP5.3 Catalogue production and follow-up observations. WP6. Preparation of legacy maps, science products and software tools. WP6.1 Software for visualization and database management. WP6.2 Forecasted impact of radio foregrounds in future CMB polarization experiments. WP6.3 Forecasted impact in other EU and International projects.